"Jeff does a great job with every service he offers"
"Jeff does a great job with every service he offers whether it is resume coaching, emotional intelligence improvement, LinkedIn coaching, etc. He is the ultimate professional you want on your team!" Yesterday while working through a coaching call with one of my managerial level clients, something really cool happened. Before I share the “cool thing”, let me first create a backdrop. My coaching client has been working with me for a few weeks. During that time, we’ve worked through his top talents to determine which talents are talents and which might already be strengths. We built a plan to turn his top talents into strengths. During yesterday’s call, my client had what I refer to as an “Ah-Ha” or “Light bulb” moment when he decided that knowing the strengths of each member of his team would give him potential to become a better manager and ultimately a better leader. By working through is his own personal experience where he became clear about his own talents, and strengths, my client used his super-high intelligence to take the coaching we were doing one-on-one to the next level. If you’re a manager and you’d like to take your managerial performance to the next level, learning precisely how you are wired is where we would start. Then we would move on to learning precisely how each person on your team is wired so you could assign each team member to responsibilities that directly align with their natural strengths. Your managerial game will move to the next level. Your team members will think you’re the best manager they’ve ever had and they’ll be hard pressed to leave you to go to work for someone else. 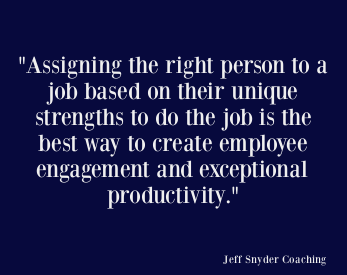 Today I’m thankful for a new career performance coaching client who is coming on board with Jeff Snyder Coaching. She is one of many rising Information Security / Cyber Security stars I’ve been fortunate to work with. She is a leader of the future. What better contribution can I possibly make than to help to prepare future leaders? I’m excited because I believe the future of Information Security / Cyber Security is now in the hands of millennial aged security professionals more than any other group. Millennial security professionals who apply themselves and who strive for greatness in their performance have so much possibility ahead of them. One of my millennial aged coaching clients is a true rising star in the information security / cyber security profession. He has a Math and Computer Science degree with a Master’s in Information Assurance. His scores on common certification exams in the security, risk, compliance and privacy realms are some of the highest recorded scores on the planet. His unique leading strengths include Strategic, Futuristic, Competition, Activator and Ideation. He is wicked smart and he is doing what is necessary to prepare him to be a future CISO despite that fact that he is still in his late 20s. It has been an honor, pleasure and an energizing blast for me to have the privilege of coaching this rising star. Another one of my millennial aged female coaching clients is currently positioned in an information security management role in one of the world’s most widely known high-tech brands. She too is a rising star. Her leading strengths include Achiever, Futuristic, Focus, Input and Competition. She came to me after having had lunch with senior executives in this global company. They told her that they wanted her on their team and asked her to write a job description she’d be willing to sign up for. I helped her to write her job description. We wrote it around her natural strengths. There is a 100% chance that she can hit a grand slam when working in a job that taps into all of her top strengths. What these two future CISOs have in common is that they are rocket science smart. They’re ultra-competitive. They grew up with technology. They can’t stand the “because we’ve always done it this way” answers. They are gifted with deep analytical skills. Not only are they highly intelligent, they’re built to create new innovations and to get new innovations off the ground. They’ll always find ways to win. They both came to me to fine-tune their performance and they’ll come back again in the future when they reach the next opportunity to stretch and grow beyond their peers. Can you understand why I’m so excited to coach these kinds of rock stars? If your company is in a hiring mode, these kinds of people do exist but they’re gainfully employed and they’re handsomely rewarded. You need an outside the box strategy to get to this kind of talent. When I first launched my career coaching and executive coaching services several years ago, I was sure that my client base would be current CISOs and CSOs who are already in place. I was sure that like me, the current CISOs and CSOs would all want to learn of ways they could improve their performance. This theory of mine worked in some cases but not as often as I thought it would. My futuristic thought process envisioned a world where CISOs and CSOs were all invited to the board room table. While this is happening in some places, it isn’t happening as frequently as I would like to see it happening and I’m afraid that it isn’t happening as frequently as current CISOs and CSOs would like for it to happen. I still see a future where CISOs and CSOs are a regular part of the board room package. What I’ve had to change in my vision is the timing and the actual people who will have this experience. What I didn’t see coming for my coaching practice was millennial aged security professionals coming to me for coaching and mentoring more often than their current bosses. Here’s the great news for millennial aged security professionals who step up right now for coaching and personal development assistance. My strengths coaching doesn’t put you in a box or a quadrant. You get to be 1 in 33,000,000 unique. We’ll figure out what you have the potential to be great at and we’ll build a strategic plan to move you in that direction. When it comes to emotional intelligence, emotional intelligence coaching and behavioral change coaching will come much easier to younger people. Behavioral change is one of the most difficult endeavors a grown adult can face. Statistically, emotional intelligence is naturally already on the rise for people in their 20s, 30s and 40s. When we work together to improve your emotional intelligence, we’re ultimately working together to improve your behavior. Behavior is much more important as your career progresses than your IQ alone. Ready To Be a Rising Star? Perhaps you’ve encountered this person? The smartest person in the room tends to dominate meetings. They don’t let others add a word to their one-sided conversations. They have a consistent need to let others know how intelligent they are. More often than not, they truly are the person in the room who was gifted with the highest IQ. When it comes to IQ (cognitive skills), the smartest person in the room frequently possesses more intellectual, analytical, logical and rational abilities than everyone else. They are drawn to highly analytical careers such as engineering, information technology or cyber security. These are careers where exceptionally high IQ serves one well. It is this exceptionally high IQ that enables the smartest person in the room to excel to a certain level. At some point though, the IQ that got the smartest person in the room to where they are will no longer propel them forward to the next level of career success. Research suggests that IQ can be responsible for as much as +-20% of one’s career success but more often than not, IQ is responsible for as little as 6% of career success. Is the smartest person in the room doomed to hit a glass ceiling in their career? Often times the answer is yes and the reason is behavior. The smartest person in the room frequently leaves a trail of relationship carnage behind them. They may not wake up every morning thinking about whom they can step on that day, but throughout the day, if they behave in ways that are natural to them, they will step on other people. What are some of the characteristics of the smartest person in the room? Talk more than they listen. Fail to consider other’s points of view. Have a constant need to be right and to win. Share opinions even when the topic they have an opinion on is not their expertise. Frequently not teachable because their regard for themselves is inflated. Fails to understand how they come across to others. Is there a cure for “The Smartest Person in the Room Syndrome”? There absolutely is a cure if the smartest person in the room can humble themselves to not just accept coaching, but they need to humble themselves to actively participate in and work on their coaching. It’s not a matter of turning weaknesses into strengths. Addressing behavioral change is more about creating strategies to manage behaviors that could impact others in an adverse way. IQ is generally thought of as being stagnant. In other words, you're as smart today as you're ever going to be. Emotional Intelligence is generally thought to be flexible in that the skills that make up Emotional Intelligence can be adjusted through coaching. A retired military 2 Star General told me a story while we shared a meal. He asked me to take a look at a person I could see over his shoulder at the next table. He asked me if I wanted to know how that person became a 4 Star General when my meal companion had only reached 2 Stars. Not that becoming a 2 Star General is an easy task but my companion really wanted me to understand how his friend and colleague reached the 4 Star level of success. Of course I wanted to know. The 2 Star General explained to me that he and the 4 Star General graduated from the same class in the military academy they both attended. They both started out with the same credentials to begin their military careers. The game-changer for the 4 Star General was his ability to be the smartest person in the room more often than not throughout his career but he learned to suppress his need to let everyone know that he was so smart. The 2 Star General told me that the 4 Star General, whom he admired as both a friend and career colleague, excelled in everything he did because he was intellectually gifted but he learned quickly that his career would take off if he learned how to treat people with respect. Listened more than he talked. Let other people win whenever possible. Considered other people’s points of view. Shared opinions when he was asked for his opinions and not just because he possessed an answer. Was teachable, trainable and receptive to being coached. The 4 Star General developed and mastered Emotional Intelligence. Think about it. The 4 Star General had to have a high IQ in order to get into a military academy. He had to have an exceptionally high IQ in order to graduate at or near the top of his academy class. The 2 Star General was confident that it was the 4 Star General’s ability to develop trust with those around him, his ability to humble himself and his ability to step into others’ shoes to consider their needs and their points of view that caused his career to excel. As a result of recently surveying hundreds of people to find out what traits they want, need and expect a leader to possess in order to be followed, these are the traits that came up most often. There are many additional traits, skills and characteristics that leaders need to possess in order to lead but what was suggested to me is that regardless of the additional skills, characteristics and traits a leader possesses, they will not be accepted as a leader unless they possess these traits above all others. Honesty: If a leader is not honest, it is assumed that the leader lacks overall integrity. Integrity: If a leader is perceived to lack integrity, it is very difficult if not impossible for followers to trust the leader. Trust: If followers cannot trust a leader, they will be very unlikely to follow this leader for any other reason. A leader who attempts to lead by way of their title will only be allowed to lead for so long if their followers find reasons to not trust them. A leader who speaks out of both sides of their mouth and a leader who consistently fails to connect their words to their actions will not be followed for long. To lead, you’ll need competency in many different areas. You’ll need to be wired with strengths that will cause others to naturally follow you. Without consistent honesty and integrity, you’ll very likely be unable to establish trust. A leader who cannot be trusted cannot lead.